For the past couple of years, Leaf (and Razor before it) has offered several cut signature products that get right to the chase. The format continues with 2011 Leaf Cut Signature Edition, a set Leaf hopes has the deepest lineup of high-end autographs yet. Each box has one encapsulated cut signature card that's been created using various pieces of memorabilia, such as photographs, index cards and signed documents. Leaf promises a broad mix of subjects ranging from politicians (George Washington, Benito Mussolini, Saddam Hussein), movie stars (Charlie Chaplin, Judy Garland, Groucho Marx), musicians (Jerry Garcia, Madonna, Elvis Presley) and other historical and pop culture figures (Mark Twain, Thomas Edison, P.T. Barnum). 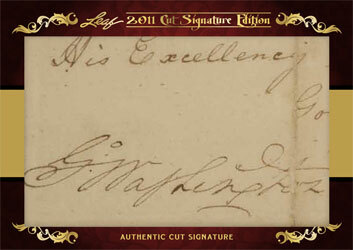 One encapsulated cut signature card. Print run of 299 12-box cases. One cut signature card in every pack. Autograph highlights: George Washington, Joe Louis, Mother Teresa, Princess Diana, Elvis Presley, Mark Twain, Ernest Hemingway, Albert Einstein, Thomas Edison, Marlon Brando. 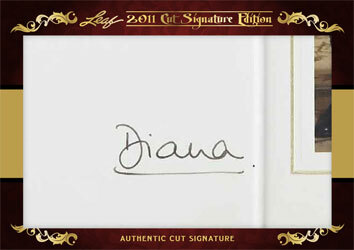 Dual autograph subjects include Marilyn Monroe and Arthur Miller, Dan Akroyd and John Belushi, George H.W. Bush and Saddam Hussein, Britney Spears and Madonna, and the Three Stooges.